interpstreamspeed(X,Y,Z,U,V,W,vertices) interpolates streamline vertices based on the magnitude of the vector data U, V, W.
where [m n p] = size(U). 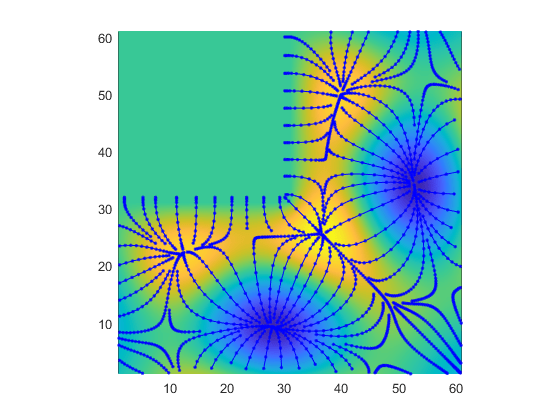 interpstreamspeed(X,Y,Z,speed,vertices) uses the 3-D array speed for the speed of the vector field. interpstreamspeed(X,Y,U,V,vertices) interpolates streamline vertices based on the magnitude of the vector data U, V.
interpstreamspeed(X,Y,speed,vertices) uses the 2-D array speed for the speed of the vector field. interpstreamspeed(...,sf) uses sf to scale the magnitude of the vector data and therefore controls the number of interpolated vertices. For example, if sf is 3, then interpstreamspeed creates only one-third of the vertices. vertsout = interpstreamspeed(...) returns a cell array of vertex arrays. Draw streamlines using the vertices returned by interpstreamspeed. Dot markers indicate the location of each vertex. Streamlines with widely spaced vertices indicate faster flow. Those with closely spaced vertices indicate slower flow. 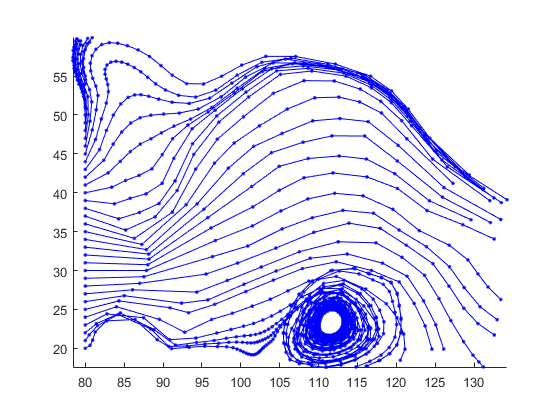 Plot streamlines to show vertex spacing as it changes with the gradient along the streamline.